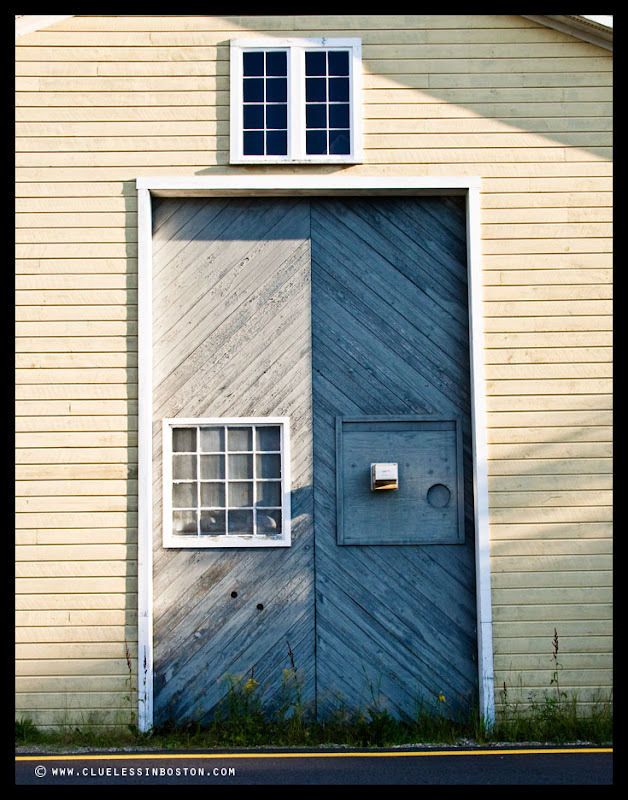 This week's doorway I found on a recent trip up the Maine coast. It does not belong to a barn, but to a wooden ship repair facility. It's beautiful, this weathered blue and the lines, just great! I love the lines and the colors of this picture. Very graphic! and the white and blue tell us about maritime things..
Why every photo of the doors is so eye catching? Maybe the life behind it makes us so interested? Windows and doors. Always. You framed the photo beautifully. That is a unique door! Nice ol' barn door. Lots of simple charm. A man is clueless, in Boston? Regardless, you pictures are evidence that you have MORE than a clue!!! oops, that should read "your pictures" not "you pictures." My first thought was, that can't be in Boston! I like it though, the light and shade and colors. It does look like a barn. Your new photo is handsome, too. The light and the lines, I like v. much.